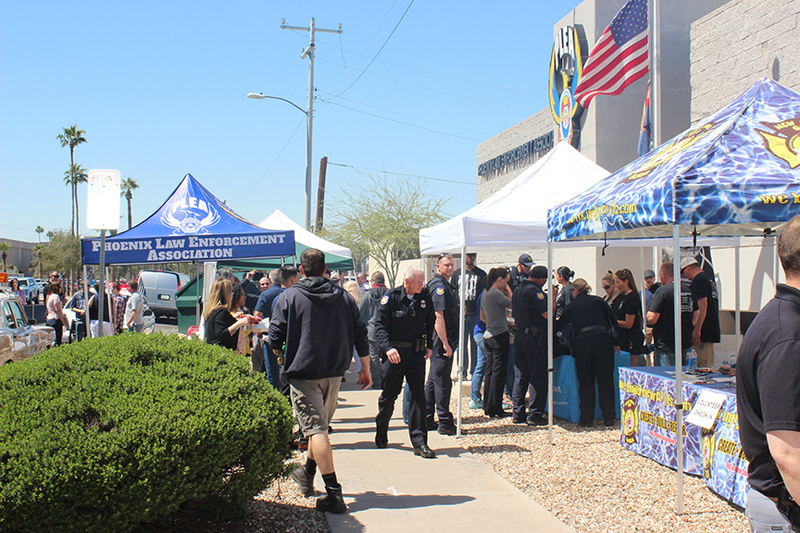 On Monday, March 25, 2019, a benefit breakfast and cookout for fallen Phoenix Police Officer Paul Rutherford was held at PLEA which ran from 8:00 am until 11:30 pm. Breakfast, with choices of pancakes, eggs, and bacon was served until approximately 10:30 am and lunch, while choices of hamburgers and hot dogs with a variety of fixins, potato salad, and chips continued into second and third shifts. There was also a variety of soda, water, sports drinks and juices to accompany the food choices. Donation stations were set up along the sidewalk on Adams Street and inside the garage at the south entry gate. People who were unable to attend the event had the ability to donate online through the PLEA Charities website. We also received a cash donation from a Costco customer while picking up additional food items because we had gone through 3,000 hamburgers by noon. As of today, proceeds from the cookout totaled $75,000 and 100% will go directly to the Rutherford family to offset their financial needs until line of duty death benefits take effect. This event would not have been possible without support from the Phoenix Police Department, the Phoenix Fire Department, and community members. Local businesses donated food, beverages and services. Phoenix Police and Phoenix Fire personnel along with personnel from other law enforcement agencies and civilian volunteers took time out of their day to assist with a multitude of tasks. Some of them included event setup, manning the donation stations, food preparation and cooking, running food and keeping the serving lines stocked, unloading and moving supplies from trucks, keeping beverage coolers filled and iced, emptying trash containers, clearing and cleaning tables, and breaking down and putting away tables, chairs, and equipment used for the event. PLEA would like to thank everyone who assisted with the event and we’d like to thank everyone who donated their time, resources, and of course, everyone who made a monetary donation.